Goal hero Paul Barden will captain an unchanged Longford side in the Leinster SFC quarter-final against Wexford this Sunday. 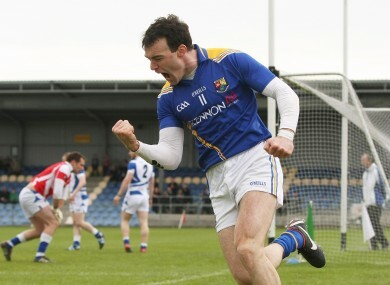 Paul Barden celebrates his goal against Laois. LONGFORD MANAGER GLENN RYAN has opted to stick with a tried and trusted line-up for the Leinster SFC quarter-final against Wexford. With no injury concerns following their dramatic comeback win against Laois in the preliminary round, Ryan has named the exact same starting XV for Sunday’s Croke Park test. Paul Barden, scorer of the goal that sparked Longford’s second-half revival that day, captains the side again from the half-forward line where he is joined by brother David and Niall Mulligan. The last meeting between the counties in the Leinster SFC came back in 2000 when Ger Halligan managed Wexford to a six-point win, 3-9 to 0-12. Longford (SFC v Wexford): Damien Sheridan; Dermot Brady, Barry Gilleran, Declan Reilly; Colm Smith, Michael Quinn, Shane Mulligan; Bernard McElvanney, John Keegan; David Barden, Paul Barden (c), Niall Mulligan; Donal McElligott, Brian Kavanagh, Sean McCormack. Email “Ryan names unchanged Longford side”. Feedback on “Ryan names unchanged Longford side”.